I've been looking at how the way I've made playlists and organised my consumption of music has changed over the years. I've been thinking about it because, whilst nowadays iTunes and Last FM track almost everything I play, I've got no playlist data from the previous 30-odd years. In the second part I was talking about my earliest memories of having vinyl records played for me - basically by shouting at my mum to put my records on. Today I want to look at the impact of the introduction of the Compact Cassette into my childhood. I remember very clearly driving through the roadworks that were destined to become the junction between the A406 and the brand new M11 extension in East London, and my dad explaining to me that he was soon going to get a "new type of radio" for the car. This meant that the music wouldn't disappear every time we went under a bridge. Yes, it really was true, the radio reception inside cars was so bad during the seventies that often a station would momentarily disappear just because you were going under a motorway fly-over. 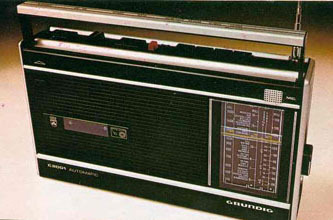 And by "new type of radio", he meant a portable cassette deck, which turned out to be a Grundig model, something like this one, with a radio included for good measure. When the BBC expanded into FM during the 1970s they changed the wavelengths of their radio stations, and I remember painstakingly sticking the new station idents onto the tuning display of that radio/cassette player. Listening to music in the car is another area where the cumulative number of plays of popular family choices would make severe in-roads into any all-time chart of my listening habits. 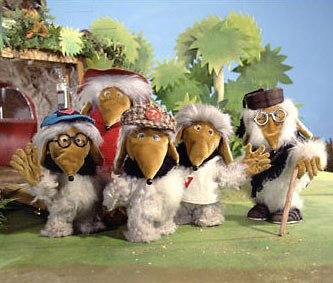 According to iTunes at the moment, the most I've ever listened to a track is 95 plays of "Juicebox" by The Strokes - but I must have heard my nursery rhymes and Womble Stories tape hundreds and hundreds of times. My parents came up with the genius idea of recording themselves reading stories from our favourite books onto a C90 cassette, alongside a few musical tracks by The Wombles. This meant that on long journeys they could pop the tape into the cassette deck, which was left sitting on the back seat between my sister and I. We were being entertained by a recording of our mum and dad taking it in turns to read stories, whilst they were actually free to have their own conversation up front. Tantalisingly, I still have that cassette with me, shipped over to Greece. 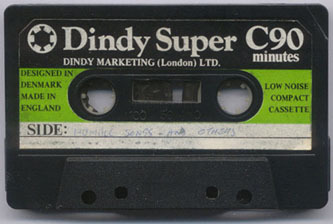 However, although the 'Womble Stories' label remains in my dad's hand-writing on a 'Dindy Super C90', the original contents have long since been taped over. Once we got beyond the age for story tapes, it was time for grown-up music in the car. Any list of music I've listened to over my lifetime would show the influence from the cassettes that my parents used to have with us in the car. With some of the most most played ones, I can still even remember the make of cassette that went with each artist, and some artists like Dave Edmunds and Rick Nelson are forever linked for me, simply because they were always on either side of a C60. The Compact Cassette format carried two types of metadata - intrinsic metadata, and that added by the user. The intrinsic metadata included how long the cassette was, and who had manufactured it. 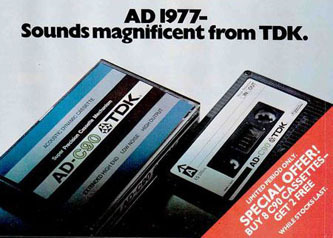 During the 1970s tapes chiefly came in 60, 90 and 120 minute formats, although the C120 was notoriously unreliable because the tape was so thin. The other vital piece of physical metadata for journeys by car was which side was re-wound to play next. By looking in the small window that showed the spooling tape, you could see whether Side A or Side B was ready to play. With limited battery life, you couldn't afford to spend much time forward winding and rewinding cassettes in the car! Back in the 1970s, the rest of the cassette metadata was supplied by my parents. Track-listings were carefully copied out by my dad onto the cassette sleeve, and the name of the artist was written on the side of the cassette. It was usual in the 1970s for nearly the whole of the cassette shell to be pre-applied with a sticker which indicated where the details of the contents of the tape should be written. It wasn't until the late 1980s that cassettes came with small title stickers that you applied yourself. 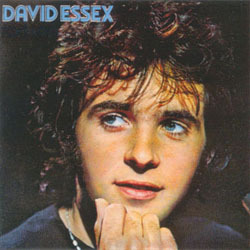 It was common, therefore, to have cassettes littered with Tipp-Ex, reflecting the number of times that they had been re-recorded. Organising a playlist for the car was a two-step process. Initially my parents either had to buy, borrow from the library, or make a cassette. If my parents were recording a cassette, the play-list would be forever fixed in the way they initially recorded it. Often my dad would buy a C60 and record on each side the better tracks from a couple of albums by the same artist that he had borrowed from the library. The next step was choosing cassettes once we were in the car. Generally there would be a couple of favourites tucked into the glove compartment, and for longer trip we might take a case of cassettes. The tape deck sat on the back-seat, so it was usually my job to pick tapes from the selection, and put them on. Hand-written track-lists, and artist name written on cassette shell. Picking tapes from the selection available in the car at the time. Only able to listen to the side of the tape that was cued up ready to play. Only able to listen to tracks in the order they had originally been recorded. The Beach Boys, Rolling Stones, Cliff Richard, 10cc, Creedence Clearwater Revival, The Hollies, Rick Nelson, Dave Edmunds, David Essex and Dr. Hook. 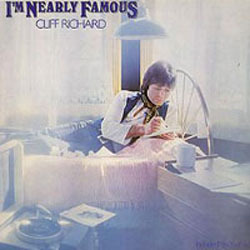 In the next part of this series I'll be looking at when I really began to take control of my own musical playlists in 1977 - when I got my first record player. By Martin Belam on 14 July 2008.